I can’t believe it’s already been 7 months since we moved from the east coast to the San Francisco Bay Area. There’s so much to see and do in this area, I think it would take a lifetime to experience everything. In fact as I recently found out, the Bay Area boasts the largest Burmese population in the US! Last week Mr. HNN and I discovered a fantastic Burmese restaurant in our neighborhood. This place takes no reservations and when we showed up on a Tuesday night, there was a line out the door and the wait time was 45 minutes (I’d hate to see what this place looks like on a weekend)! We signed up for the next available seating and went a few doors down for a couple of cocktails to tide us over. About an hour later we finally got a call, our table was ready. The place was loud and the tables were packed like sardines. As soon as we were handed the menus, I could immediately understand the buzz – I wanted it all! Burma (better known today as Myanmar) shares a boarder with Thailand, Loas, India, Bangladesh, and China; so you can imagine the incredible influence these countries have had on shaping Burmese cuisine. We ordered a number of dishes, wanting a variety to taste. They were all wonderful, but I must say, there was one that particularly stood out for me – the Garlic and Chili Shrimp. With the flavors still fresh in my mind (or perhaps I should say fresh on my tongue), I got to work the following day on recreating this dish. 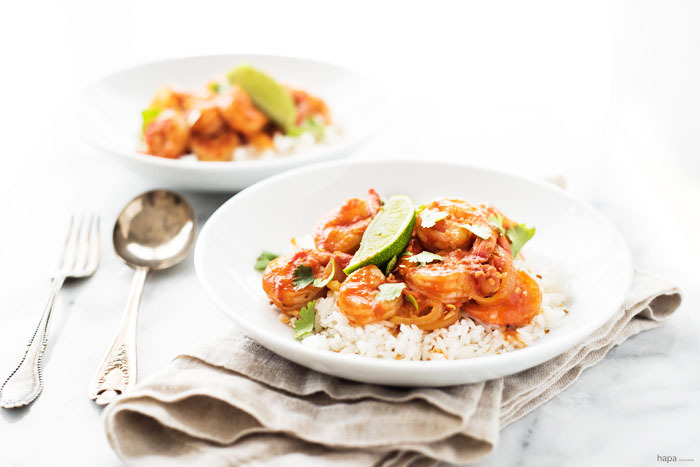 The resulting Spicy Chili Garlic Shrimp with Coconut Rice is a phenomenal dish with a gentle heat and a deep, full flavor that pairs perfectly with the sweet coconut rice. Squeeze a little fresh lime juice overtop, sprinkle with toasted coconut, and you’ve got a dish full of flavors that continues to compliment over and over again. You’re going to fall in love how quick and easy it is to make, the crazy-good aromas coming from your kitchen, the incredible flavors, and guess what – it’s healthy too! Seriously, what’s not to love?! 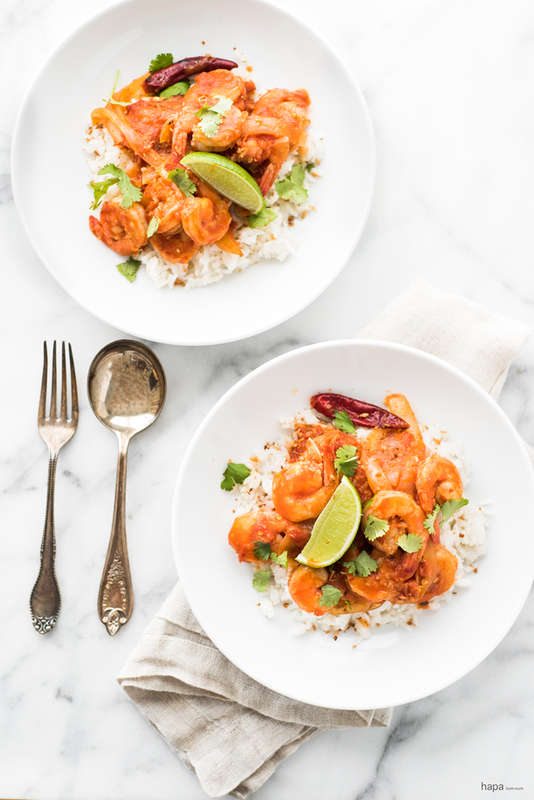 Lime, Coconut, & Shrimp - the Trifecta is Compete in This Burmese-Inspired Spicy Chili Garlic Shrimp with Coconut Rice and a Squeeze of Fresh Lime. Healthy and Totally Delicious! Rinse the Jasmine rice by placing the rice in a large bowl of cold water and swish the rice around with your hand until the water becomes cloudy. Carefully pour off the water and repeat the process of rinsing and pouring about 3-4 times. In a saucepan bring the coconut milk, sugar, and salt to a simmer over medium-high heat - careful not to let it boil. Once the coconut milk is simmering drop the heat to low, add the rice, give a quick stir, and cover with a lid. Cook for 15 minutes - no peeking. Turn off the heat and fluff the rice with a fork and cover with a lid to allow the rice to steam for about 10 minutes. Then taste and add more salt if desired. While the rice is cooking, toast the shredded coconut. In a pan over medium heat, add the coconut. Stir frequently until the coconut is lightly browned. Do not walk away from the pan, once the coconut starts to brown, it goes very quickly. Heat the oil in a large wok or skillet set over medium-high heat. At the first wisp of smoke, add the onion, garlic, ginger, and chilies. Stir-fry until lightly brown (be careful not to let the garlic burn). Add the tomatoes, sambal oelek, paprika, and salt. Reduce the heat to medium and cook until the tomatoes have softened. Stir in the fish sauce and add the shrimp. Increase the heat to medium-high and stir-fry for 3-4 minutes, until the shrimp is opaque. Plate the rice and spoon the spicy chili garlic shrimp overtop. Sprinkle with toasted coconut, cilantro, and a wedge of lime. Serve and enjoy! * I left the tails on the shrimp because I like the way it looks. It's also kind of fun to get your fingers in there and lick off the wonderful sauce. Though if you prefer, feel free to take the tails off prior to cooking. * Sambal Oelek can be found at just about any grocery store these days. It's often sold right along side Sriracha. I was totally thinking about you the other day, because Boy and I were talking about how we have lived in NC for over half a year and you guys moved right before us. Crazy how time flies!! Love this chili garlic shrimp dish, girlfriend! You are right, the flavors look and sound phenomenal! The coconut rice sounds like the perfect accompaniment! Definitely making this for dinner this week! Cheers, doll! Awesome video Kathleen! I’ve never tried a Burmese recipe, but will try this one! Looks amazing! Your videos are fantastic, Kathleen. Loving them! And this rice platter looks so deliocus and gorgeous. Love the pairing with coconut rice. Thanks, Anu 🙂 I think I could eat the coconut rice with just about anything! I have never been to a Burmese restaurant. But I love the idea of mixing of Thai, Chinese, and Indian flavors. This chili garlic shrimps look scrumptious! And that coconut rice? Sweet and creamy! I can’t wait to try that. Oh I think you would totally love Burmese food! It’s like a flavor explosion! Happy Eating? Nothing but! Thank you for another beautiful and instructive video! You know I love ’em! 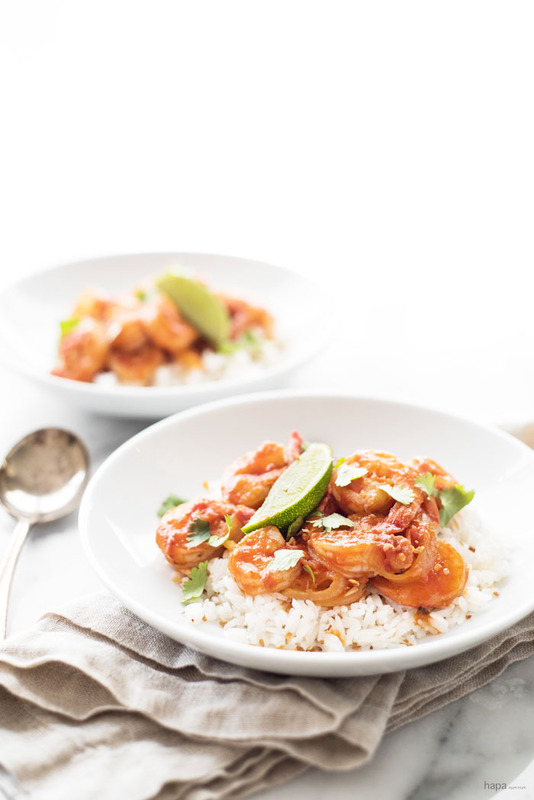 The rice alone has me swooning but boy am I craving those spicy shrimp! I love when you and your hubby go out to eat! We all benefit! And PS) I can’t believe it’s been 7 months already – too fast! Sounds like a wonderful place to live! Oh, I love trying new places!! Your dish looks awesome, too 🙂 I love coconut rice, well pretty much anything coconut flavoured…YUM. Gotta try this one – really healthy and quick to make – my kinda recipe! Sounds and looks like an amazing dish! Never tried Burmese, not even sure we have a Burmese restaurant here, looks like I have some investigating to do! Bl00dy h3ll Kathleen, your videos are SO GOOD! And your food….it makes me want to cry, it is so my type of food. I LOVE burmese food. I had a burmese guy who worked for me once, and he used to bring the most amazing lunches in. I hovered and pestered so much when he was trying to EAT that he eventually started bringing extra food in for me – BA HA HA!!! And that’s where my love of Burmese food started 🙂 I actually find the curries easier than SE Asian ones and your video proves it! Sharing majorly, and I NEED TO MAKE THIS!!! Here I go swooning again! The spicy chili garlic, the shrimp, the coconut rice…it’s music to my ears! It’s easy to see why this dish stood out for you. I’ve never been/or seen a Burmese restaurant, but it sounds like my kind of place. Ooo! Do you remember the name of the Thai restaurant?! I’m always down to try a new place! Such a beautiful-sounding curry, Kathleen – and I just love that it’s Burmese, a cuisine that I really know nothing about. How wonderful to go to such a popular restaurant to check it out! And of course, I love the video! Thanks, Helen! I think you’d really like Burmese cuisine – there’s such a wonderful balance of flavors! I can tell just by your ingredient list I would love this recipe!!! Of course to pair it off with some delicious coconut rice would be divine! I’m totally unfamiliar with Burmese cooking, but, by the geography, I need to get to know it! What a fantastic fusion…I’m jealous of you and all of those SF restaurants…maybe the best food city in the world. I’ll be trying this recipe pronto! I’m quickly figuring that out 😉 There’s a lot of little gems out here to be discovered! Ok. I’ve probably said this before, but totally jealous that you get to live in San Francisco! My sister lives there too, so I always think of her when you talk about SFO. I LOVE your videos! I don’t know how you do all that live and put everything in those white dishes without making a mess everywhere! I would have splashes all over the place. Anyhoo – the point here is that your shrimp and coconut rice look delicious and beautiful! Sounds amazing! Such a big move across the US – I imagine both sides are quite different culturally as well. We visited my aunt and cousins in Del Mar last year and the coastline is just BEAUTIFUL – San Fransisco is very high on my list to travel to at the moment! This curry looks awesome too – so many gorgeous spices and flavours going on. You always know a restaurant is awesome when there is a wait-time like that – there are a few places in Melbourne that if you get there later than 6pm you are normally looking at a 1.5-2hr wait time – so crazy! Time zooms by so fast. And when you’re living in a new area, there’s so much to explore, new experiences to be had. It goes even faster it seems. What a luscious and gorgeous recipe, Kathleen! One of the best things about going out to eat is coming home to recreate a recipe you’ve fallin in love with in your own kitchen. That’s one of the best things about going out to eat… well, save the dishes! Your video is perfection too… I’d love to learn how to do it! Thank you for this my dear!